The venue is fully accessible from the last mile, to the toilets and through to the seating bowl. Should you require any further help whilst at the venue, don’t hesitate to ask a Hockey Maker or a steward. For all accommodation enquiries please email accommodation@eurohockey2015.co.uk and we will do our upmost to find you the best possible rate. Please note as we get closer to the event and hotels become booked, we may not be able to find you something close to the venue. Don’t forget to purchase a Ministick for your favourite players to sign at the Fun Zone where all teams will be asked to participate in autograph sessions. There will be scheduled sessions throughout the week, taking place in the Fun Zone. We’ll keep you updated on times through the big screen and announcements. There are lots of bike racks available at the VeloPark, however should you not be able to get a space, you can park your bike in car park A at Westfield Stratford. At our Information Point we will have a buggy park; this is located upon entry to Festival Square on the left hand side. Please ensure you take all valuables with you. As our event is for the whole family we welcome babies and children. Under 2s are free on the knee and baby changing facilities are located in the toilet area in the East stand building. Be aware of Hockey balls particularly during warm up and matches on the field of play. We are proud to inform you that all the England and Scotland matches will be available to watch on the BBC Red Button with other matches available online. Should England or Scotland get to the final(s) this will be shown on network television, the channel to be confirmed. There are a number of banks in close proximity of the venue such as Westfield Stratford and all our catering and retail outlets accept cash and card payments. There are no cash machines located at the venue. We have 3 big screens available; one in Festival Square and two in the seating bowl, which will be showcasing the matches, highlights and Q & As at all times the gates are open. The nearest public car park to the venue is at Westfield Stratford which can be found by using this postcode E20 1EJ or E15 2EE for older devices. Go to the Westfield Stratford Website for further information. The Club House is located on Market Street at the south end of the venue. We look forward to welcoming different groups who will host and entertain their members in this relaxed environment. There will be fresh drinking water available onsite for consumption. Various food options are available catering for all your dietary needs. We have thirteen different food outlets with food from for all eleven different participating countries, so one day you could have a Crêpes and next day a Bilini. Both Festival Square and Market Street have bars which will be selling alcoholic and soft drinks. New for this year we will be selling plastic bottles of wine, which you can enjoy responsibly with all you friends. Please refrain from bringing any alcohol into the venue, any found will be confiscated. On all our match days we will open the gates 1 hour before the start of the first match of the day, with the seating bowl opening 45 minutes before the first match of each session. We encourage you to be seated 10 minutes before the match start time to see all the build up and anthems. If you have a ticket for the first session you’re welcome to stay on in the event village, take in the atmosphere and watch the next matches on the big screen. If you have tickets for the second session in the day why not get there early, you’re welcome to arrive and take in the atmosphere. Gates will close approximately 1 hour after the last game of the day. We have rolling entertainment on and off the pitch throughout the day with a stage in Festival Square playing host to Q&As with athletes and great live music from local bands. The Square will be alive throughout the day. There will be a First Aid unit onsite for spectators. This is located in Festival Square on the left when you come over the bridge from the main entrance, near the Event Information Point. The Fun Zone will have plenty on offer from skill workshops to games on our new inflatable pitch. There will be colouring for the little ones and a speed cage for everyone to come and test their drag flick skills. Filming for personal use is allowed. Owing to broadcast restrictions, lengthy filming for wider public access is strictly prohibited. Unfortunately all glassware is prohibited on site. If you are in hospitality there will be a decanting station before you exit. The Hockey Museum located in on Market Street will be playing historical video footage and showing artefacts from as early as 2000 BC. When entering the venue, turn right into the Street Market and the Hockey Museum is on your right hand side. Running from the 29th August through to the 13th September 2015 HockeyFest is a fantastic opportunity for clubs to promote their club, and the social aspect of their club, by being part of a national hockey festival. Go to the HockeyFest page of the England Hockey Website to find a Fest near you. We have over 300 Hockey Makers who look forward to welcoming you to the Unibet EuroHockey Championships. They aim to make your experience as entertaining and enjoyable as possible. Don’t hesitate to ask them any questions at any time during your visit – look out for them in the bright purple tops. We have a variety of hospitality packages available; please contact hospitality@eurohockey2015.co.uk for more information. If you decide on the day to make your experience more memorable, we invite you to upgrade to hospitality on arrival and experience what Unibet EuroHockey Championships Hospitality has to offer. There is an Event Information Point located next to First Aid on the left when you come over the bridge from ticketing and a second one in Festival Square. This is will a key source of info for everything related to your event experience and any questions you may have on the day. We have wristbands available in our Information Point to place on children with a contact number. Should you become separated from your child at the event, please make your way to the Information Point where our team will support you to be re-united. Don’t be the only one without a piece of Unibet EuroHockey Championship or England Hockey Merchandise. There’s a great range available from key rings and mini sticks to England team shirts and much much more! There will be Investec phone charging stations onsite located in the Investec marquee in Festival Square. Look out for the Zebra too! Lee Valley Hockey and Tennis Centre sits within Queen Elizabeth Olympic Park where 8 Olympic Venues once stood. Lee Valley Hockey and Tennis Centre, played host to the Wheelchair Tennis competition at the 2012 Paralympics – centre court being where the main hockey competition pitch is now. Running parallel to the Unibet EuroHockey Championships, the European Hockey Federation and England Hockey are organising the Euro ParaHockey Tournament in London, 24th – 26th August 2015. The 3 day tournament will take place in Old Loughtonians Hockey Club, and the final will be held at the Lee Valley Hockey &Tennis Centre on Wednesday 26th August, in between the Women’s pool games at 15.00. Visit the EuroHockey website for more detail. To keep the pitch in tip top condition we will be watering when necessary. The Timberlodge Cafe on the Last Mile has a multi faith prayer room for use during your time at the venue. Programmes will be on sale at the venue for £6 with all the team news, features and event information. 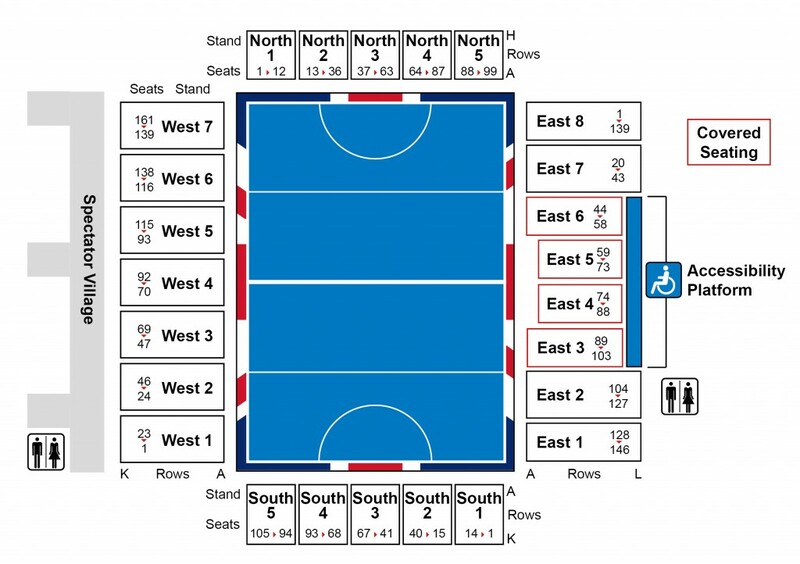 If you visit the http://eurohockey.seetickets.com/tour/eurohockey-championships-2015/ ahead of the event you can save £1 off the price and ensure you don’t miss out on this great event guide and souvenir. Alcohol, cigarettes, glass bottles, and sharp objects are all prohibited items to bring onto site. Only alcohol purchased on site will be permitted. As with every major sporting event there may be an element of queuing involved. Although we have done our best to alleviate any wait time, there are a couple of things you can do to ensure queues are kept to a minimum: Leave in plenty of time and come and check out the spectator village; don’t rush and take your time to take in the sites of the surrounding area along the last mile; don’t rely on public transport timing! Teams are split in two pools of 4 based on their world ranking. The top two qualifiers from each pool after the initial stage will crossover with 1v2 playing eachother, similarly losers will crossover with 3v4 from each pool playing each other. The championships will culminate with the winners and losers from each crossover match playing in either in a classification or a medal match. Queen Elizabeth Olympic Park has come alive since the 2012 Olympic Games, with visitors able to explore the unique parklands, waterways, venues and ever changing attractions. Go the Queen Elizabeth Olympic Park website to plan your visit. If you wish to leave the venue at any time and plan to return later please make sure that you request a yellow wrist band from one of our Hockey Makers at the main entrance. You’ll need to show your ticket again also on re-entry. You can follow all the scores and stats live as they happen through our event website, http://eurohockey2015.co.uk/ There will also be a results board at the Information Point which will be updated throughout the event. We are proud to have Adidas on board as our Official Apparel Partner. Adidas will have a store onsite to trial sticks and pick up official Adidas gear. There will be a number of other retail outlets onsite selling merchandise and hockey equipment, including the England Hockey Store selling England branded clothing and merchandise. Will this be your first time at the Hockey? WELCOME! We want to ensure you leave the venue understanding the basic elements of our sport. Look out for rules on the Big Screen and in the programme, also listen out for our announcer Howard who will educate you during the games. You can also go the Rules Page of the England Hockey website to find out more. The entrance to the venue brings you into Festival Square on the WEST side of the pitch, all west seats can be accessed from Festival Square. To access the EAST stand, you will go down the Street Market on the South end to stairs that will take you up – SOUTH seating can be accessed from either the east or west seating access. NORTH seating blocks can be accessed from the far end of Festival Square. We will have 24/7 security cover on site for the duration of the tournament. Spectators may be subject to random bag checks. We apologise in advance for any inconvenience this may cause. Lee Valley Hockey and Tennis Centre is a Smoke Free venue therefore should you need to leave the venue you will need to get a pass out from ticketing. If you are seen smoking onsite one of our friendly Hockey Makers or Stewards will remind you and ask you to put it out or pass out. FOLLOW US! We’ll be posting updates of all the action and goal highlights throughout the event, plus lots more! We want spectators to be at the core of every experience, and in turn want to cater the experiences we offer to the spectator. We want to hear all about your day, to ensure we continue to do the right things well and change others for the better. Voice your opinion when we send out our post event ticket holder survey. There are two trophies teams will be in contention for; Men’s Unibet EuroHockey Championship trophy and Women’s Unibet EuroHockey Championship trophy. There will also be the following individual awards for both men and women; Top Goal Scorer, Men’s Player of the Tournament, Women’s Player of the Tournament proudly sponsored by Investec and Goal Keepers of the Tournament. Lee Valley Hockey and Tennis Centre is a 20 minute walk from Stratford Station and Stratford International. Several bus routes connect Lee Valley Hockey and Tennis Centre with Stratford and Queen Elizabeth Olympic Park. The 308, W15 and N26 all stop outside Lee Valley Hockey and Tennis Centre and the 97, 339, 388 and N205 all run through Queen Elizabeth Olympic Park and stop nearby. Bike racks are available at the VeloPark. Please bear in mind restrictions on bikes on public transport. There are good pedestrian links to Lee Valley Hockey and Tennis Centre from Queen Elizabeth Olympic Park, Westfield Stratford City and Hackney Wick. We suggest taking the last mile route as shown under the map section. PLEASE NOTE Online tickets will go off sale at midnight the day before. There will be plenty of toilet blocks including accessible blocks onsite. Despite it never raining in England, one must always be prepared. We suggest an umbrella for unexpected downpours or purchase one at the onsite store. Please take into account other peoples experience when using an umbrella in the seating bowl. As title sponsor of the Unibet EuroHockey Championship 2015 we’re delighted to have Unibet on board for these Championships. Unibet is one of the largest online gambling operators in Europe; offering sports betting (pre-match and live), casino games, bingo and poker to over 10 million registered customers in more than 100 countries. They are offering online betting for this event – you must be 18 years of age or older to participate. Visit the Unibet website to place your bets. Unibet is also offering a chance to win a seat on the Unibet Best Seat in the House. Look for details on how to win on site. Look out for the Unibet Push Your Luck game on the Last Mile along with the Unibet 4×4 – you won’t be disappointed! Entrance to the venue will be on Queen Elizabeth Olympic Park at the end of Abercrombie Rd, immediately outside the Velodrome. Come Rain or Shine, we’ll bring the smiles to brighten your day. But just incase, bring a warm jacket for those late sessions. There will be limited access to WIFI onsite. But wait, there’s more…Lee Valley Hockey and Tennis Centre will play host to FIH Women’s Champions Trophy, 18-29 June 2016. Tickets will go on sale during the Unibet EuroHockey Championships, so be the first to secure the best seats! Back to Hockey sessions are fun, sociable and informal and aimed at people who either haven’t played hockey for a number of years or who are looking to play for the first time. Don’t worry if you’re nervous or don’t remember any rules our Back to Hockey coaches will gently guide you through this series of fun and friendly sessions. We promise it’s nothing like the school days of muddy pitches and standing around waiting for a touch of the ball!